CHLOE – LACE CHRISTENING GOWN. We have this beautiful gown now on sale. 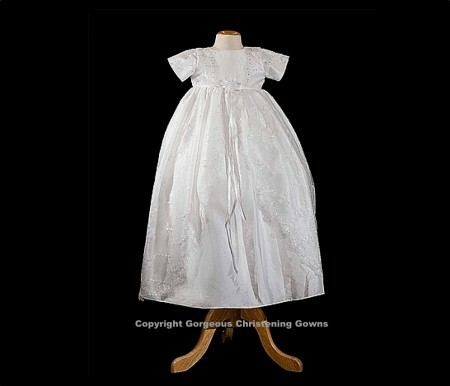 This exceptionally beautiful short sleeve christening gown is accented with a striking beaded embroidered lace overlay. The gown has a split style skirt which is finished with a lovely scalloped edging. This gown is made of very high quality craftmanship. We currently have our last few gowns in stock which would suit a baby approximately 8-10kg. Refer to size chart. The gown has now been reduced to $129.95 (Original price $189.95), with free delivery across Australia. Matching Bonnet is also included.